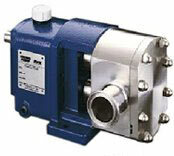 The Classic+ is a positive displacement rotary lobe pump designed using the latest innovative computer aided techniques and manufactured to meet today’s stringent demands for high product quality, reliability, ease of maintenance, economy in purchase and low life time costs. VERSITILITY AND SAFETY: For maximum flexibility, the feet of the pump may be removed and re-set to change the drive and port orientation to operate with the ports in a horizontal or a vertical position or to accommodate a top or bottom shaft drive. For heat sensitive applications, jackets may be fitted to the rotorcase and/or front cover to either heat or cool the pump head. To protect the pump, a spring operated relief valve may be fitted to the front cover. This can be set on site to protect the pump from over pressurisation and is available with air operation for automated CIP processes. STAYS CLEANER: Hygienically designed, it combines a gentle pumping action for delicate liquids with soft solids as found in the food industry whilst robust, stainless steel construction is suited to the aggressive slurries and pastes of the chemical industry. For hygiene and corrosion resistance all product-wetted parts are manufactured from AISI 316L (DIN 1.4404) type stainless steel. EASIER MAINTENANCE: The mechanical seals are of cartridge design with the rotary seat retention isolated from the pumped medium giving improved operation and easier assembly, setting and maintenance. Available in single, flushed or double seal configurations, all seal combinations use the same component wearing parts. Self draining when ports vertical.